Though largely forgotten nowadays, Dan Dailey was nominated as best actor at the 1948 Academy Awards for his performance in this film, alongside Montgomery Clift for The Search and Laurence Olivier, the eventual winner, for Hamlet. Dailey is magnificent in this remake of the hoary old Broadway play Burlesque, which had already been filmed twice, as The Dance of Life and Swing High, Swing Low. 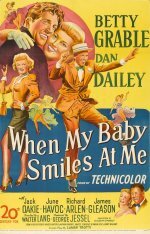 Top-billed Betty Grable isn't Dailey's equal in the drama stakes, though they regularly co-starred in lightweight 20th Century-Fox musicals, but she tries hard, and director Walter Lang knows well enough when to sit back and let the actors get on with it. In all, a very satisfying movie.